Nothing says St. Patrick’s Day like a green beer at noon. At least, disinfection that’s what it meant in college. Now that I’m “all grownup” drinking green beer, discount especially before noon, is “frowned upon”. Yet, I have to do something to celebrate the patron saint of Ireland, and nothing is more Irish, or more celebratory, than Guinness. I happen to absolutely love Guinness. (We drank quite a few on a cruise we recently took to the Bahamas. I think all of the bartenders on the ship came to know us as the Guinness Couple.) You may have noticed my Guinness Mustard a few weeks ago. Now, it’s Guinness Brownies. Ah, Guinness Brownies. They are moist and a little malty, super rich and very chocolatey. I love them so. No better way to celebrate St. Patrick’s Day than with a batch of these brownies. Trust me. 8 oz. dark bittersweet chocolate bar(s), chopped – I used 70% dark. Your call here. Preheat the oven to 375° and line a 9 x 13 baking dish with parchment (or grease it). Whisk the flour, cocoa powder and salt together. Set aside. In a very big bowl, whisk the eggs and sugar together until slightly frothy. Very slowly, pour in the chocolate mixture while whisking the eggs. If you go too fast, you’ll have scrambled eggs, so take your time. When your chocolate mixture and your eggs are combined, whisk in the Guinness. Fold in the flour mixture very slowly, making sure not to over-mix. You want to see some crumbly bits still in there. Pour the mixture into the prepared baking dish, top with the cup of semi-sweet chocolate chips and bake for 25 – 30 minutes or until a toothpick comes out clean. Remove the baking dish and let cool completely. Dust with powdered sugar. Makes about 2 dozen large brownies. Man, those look delicious! I love the combination of Guinness and chocolate. They go so well together. I’ve seen lots of recipes for cakes, but not brownies. Love it! Fantastic! Can’t wait to make these this weekend! Beer and chocolate? Perfect! They look so moist and delicious! I remember those days of green beer at noon… that thought no longer appeals to me at all, but these Guiness brownies sure do! You can see how moist and dense they are. They look awesome. Can’t help but love a recipe that uses good beer. Definitely a recipe to try for San Diego’s upcoming St. Patrick’s Day Parade this Saturday! Thanks for sharing! Stouts are my favorite! There is no mercy here..how can you do this to people? do you smear this all over yourself then eat it or the other way around please help. My roommate and I have started baking w/ whole wheat flour and we actaully prefer it over white lately! It adds a little something to the finished product that we find appealing! 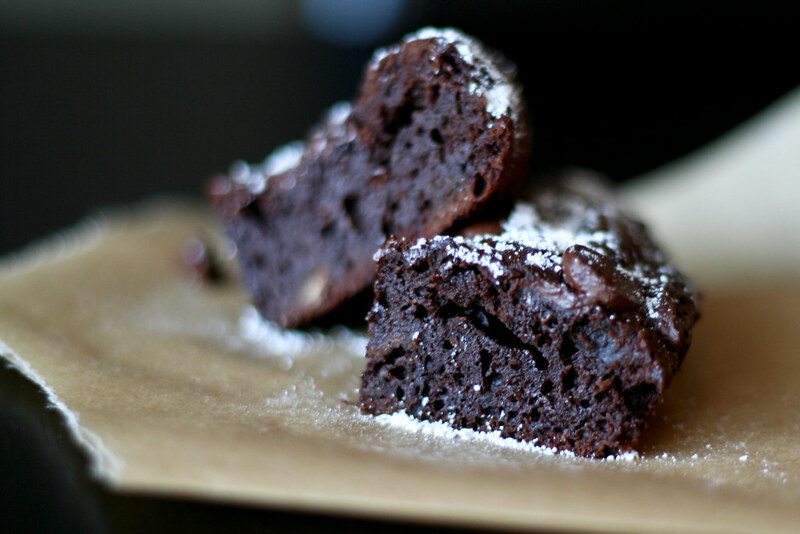 I love gooey, fudgey brownies and these look incredible. Guiness and chocolate – awesome pairing:) Will probably be making these this weekend! Yum! These look great and I know baking with Guinness makes for some yummy, yummy treats! I live in Costa Rica and unfortunately, I don’t think you can get Guinness here. Do you think replacing any dark stout beer would yield similar results? Perhaps, I’ll give it a try! WOW – those look fabulous!!! 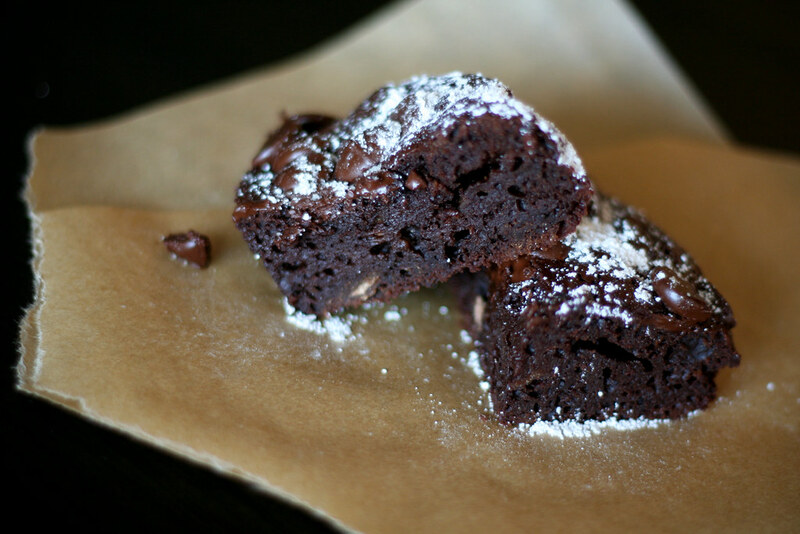 Guinness + brownies = perfect Saint Pat’s Day! Thanks for posting! They look deliciously fudgey. I’m making Beeramisu using Guiness for St. Patty’s day. I may have to try these too! I love to cook with Guiness and I’ve even made Guiness Ice cream floats but BROWNIES!!! I’ve just died and gone to heaven! I love how every recipe I’ve found today contains Guinness :) These brownies are the best looking so far, can’t wait to try them out! These brownies are absolutely amazing! But I’m out of Guinness at the moment and want to bake another batch tonight. I’m debating replacing it with milk or a lager. I’ll let you know what I do and how it turns out. I made this over the weekend and they are wonderful! You can’t really guess that there is Guinness in there but it definitely gives it a “special something” and I love that there is whole wheat flour too and that it’s not too sweet. Thanks! it’s a keeper and I have posted it on my blog (in French) I hope you don’t mind. I made these tonight and I am in awe. You have such a way with food. Oh and the buffalo sweet potato pizza rocked our world. Wow, these look so rich and decadent. I bet my hubby would really love these! Haha! That is funny! I love this website! “Guinness Brownies | Bitchin Camero” really causes me imagine a somewhat extra. I actually loved every particular section of it.